West India Docks and LBR – The Literary World, 1840. Anyone who has travelled on the Docklands Light Railway to Bank or Tower Gateway will have no doubt enjoyed the view from the train high above ground level. 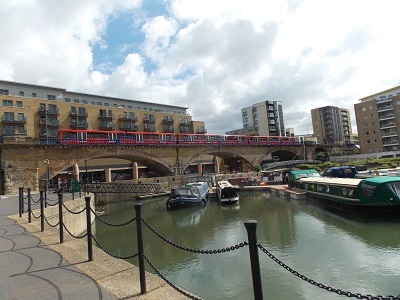 It might be a surprise to many that one of the most modern London railways is travelling on viaducts which are well over 150 years old and are part of the intriguing story of the First Docklands Railway. A newspaper report from 1840 provides some of the details about the innovative London and Blackwell Railway. A new and important addition to the vast internal resources of this country was made on Saturday by the opening of the London and Blackwall Railway, running between the Minories and the river at Blackwall, presenting to the commercial world an immense saving of time, risk, and expense. The tedious and perilous navigation from Blackwall to London Bridge may now be entirely avoided, which heretofore has occupied more than one-fifth of the whole passage to Gravesend, and the Pool itself may at the same time be relieved from the dangerous presence of the large steamers and other vessels which may henceforth transmit their passengers and cargoes to the heart of the City, by the medium of this railway in the space of ten minutes. The trains are propelled to Blackwall by means of two stationary engines of 120 horse power each which are worked in shafts sunk into the earth to 4 the right and left of the lines. To these engines fly-wheels, or as they are technically termed ” drums, ” are attached, each of which is of the ponderous weight of forty-three tons, and are twenty-two feet in diameter. A ” tail ” rope is fastened to the drums, which is wound and unwound at each end by the stationary engines, there being also two engines of seventy-horse power each sunk beneath the Blackwall terminus. 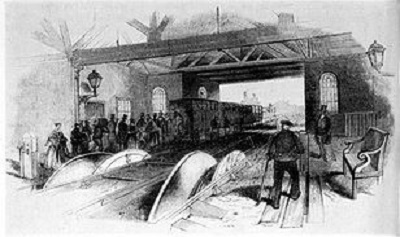 As the train proceeds to the latter place the drums at the London terminus unwind the rope by which the carriages are to be again drawn to London: and to prevent the rope flying across the sheaves on which it runs too rapidly, and thus becoming entangled, in consequence of no weight being attached to it, an ingeniously contrived break is placed on the platform by the side of the railway. at which a man is employed to regulate the unwinding of the rope. The rope is not an endless one, similar to ‘that employed at the Euston Square station of the Birmingham railway, but it is in two parts, namely, one for propelling carriages to Blackwall, and the other from that place. It was manufactured by Sir Joseph Huddart and Co. of Limehouse, and cost upwards of £1,200. The drums take 80 turns to every mile of the ropes, each of which is three miles and half in length. The electric telegraph is the next object of attraction, and it is enclosed in a neat mahogany case, which is so far as it is seen, above the ground and a small bell announces when the train is to be put in motion. The telegraph is the invention of Messrs. Cook and Wheatstone, and enables parties at each end of the railway to ‘hold conversation with each other. At each of the intermediate stations one of the telegraphs is placed to enable the servants of the railway to communicate with the engineers of the terminus and it was stated that notice of any impediment or casualty might be given at an intermediate station to one of the termini, and from thence conveyed to the other end of the line in the short space of three seconds. The Blackwall terminus is roofed in a light and elegant manner, and every precaution appears to have been taken to preserve the carriages and protect the travellers from the weather at inclement seasons. At the London terminus the roof is only temporary, as it is intended to complete,as soon as possible, the remainder of the line to Fenchurch-street, where a grand terminus will be erected. Adjoinging the Blackwall terminus, capacious offices and store-rooms have been built immediately fronting the river, the Brunswick Wharf and property, belonging to Sir Robert Ingram having been purchased for that purpose. The architectural part of the railway is neat and unostentalious and was designed by William Tite, Esq, the successful candidate for the building of the New Royal Exchange. The line proceeds on a series of arches from the Minories to the West India Docks, across the Regent’s-canal and the Lea. The span of the arches crossing the canal and river is from thirty to forty feet, and from the West India Docks the line runs upon an embankment, and the ground falls into a very rapid decline of 1 to 150. So that from the Marsh to the Blackwall terminus the embankment is but a few inches in height. The difference is the level of the line from one end to the other is l8 feet. The three intermediate stations, namely the Stepney, the Limehouse, and the Marsh, are exceedingly neat externally, and conveniently fitted up internally for passengers who have to wait for the trains. 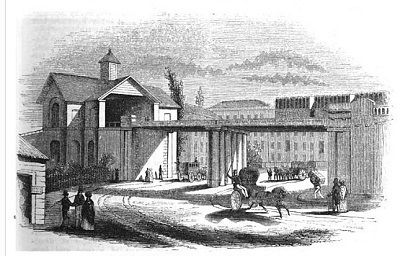 The railway is fenced in with a light and ornamental iron palisade, and the ironwork also presents a more pleasing view to the eye as Mr Jackson, the builder, had the contract for the London end, Mr Webb for the centre, and Messrs Peto and Glissell for the Blackwall terminus of the railway. The length of the railway at present is three miles and a quarter, when it is carried on to Fenchurch-street it will be three miles and a half. The works hitherto have cost about £150,000. The stationary engines, it was said cost about £30,000. The carriages are of a deep blue colour picked, out with gold, and the panels bear the City arms surmounted by a steam vessel, the whole encircled with the words, “The London and Blackwall Railway Company” The first class carriages are of the usual description, except that there are no elbows to the seats. They are each divided into three compartments, and are intended to hold thirty-two passengers. The fare to either of the stations will be 6d. by the first class, and 3d by the second class. The second class carriages are of the same construction as those of the Manchester and Leeds Railroad, and are termed by engineers, ” Stand-up,” there being no seats to them, and the passengers having to stand during the journey. 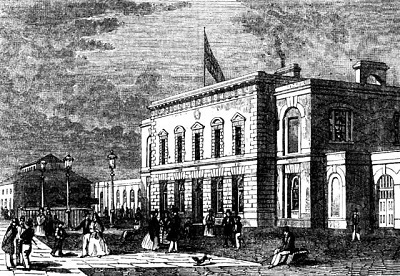 The line opened in 1840, and the company changed its name to the London and Blackwall Railway on completion of an extension to Fenchurch Street in 1841. 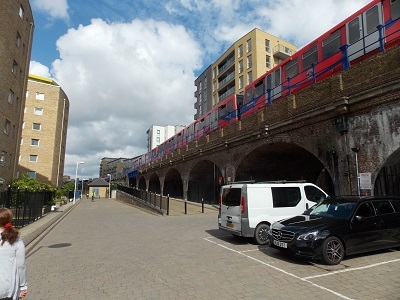 A line from Stepney linking it with the Eastern Counties Railway at Bow was opened in 1849, became known as the London and Blackwall Extension Railway (LBER). 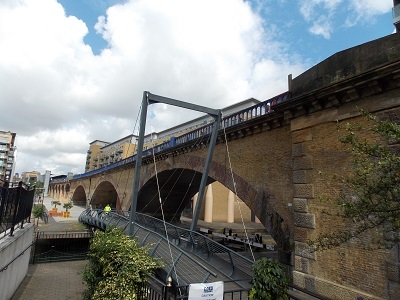 In 1849, it was decided the rope mechanism was too inefficient and the railway converted to steam, other branch lines were added including the Millwall Extension Railway which served the Millwall Docks and later the line was extended to North Greenwich ( Island Gardens). Towards the end of the 19th century and early 20th century the line took passengers and goods to the various docks and to Blackwall that had for centuries been a major embarkation and imbarkation point in London. However , passenger traffic was closed on the railway in 1926 as a result of competition from trams. The carrying of goods carried on until 1968 before that was closed down and much of the track ripped up. Remarkably, the first Docklands Railway may have closed but much of its infrastructure was reused as part of the Docklands Light Railway. When the Docklands Light Railway opened in 1987, it used much of the L&BR line between Minories (Tower Gateway) and Westferry. When you are using the DLR between these points or walking next to the large impressive arches, the viaducts give a few clues to their origins has part of the track of one of London’s earliest railways. By isleofdogslife in Human Life on July 13, 2016 . Very interesting. Really pleased to have discovered this blog. Thanks.